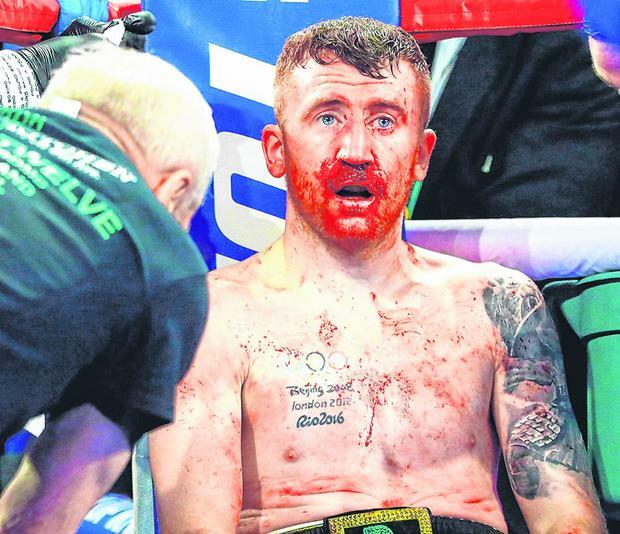 Three-time Irish Olympian Paddy Barnes probably knows he can return to the amateur ranks if the professional game is not working out for him. Barnes, only the second Irish athlete to win successive Olympic medals, after Pat O'Callaghan, is considering retiring after having his nose broken by Texas journeyman Oscar Mojica at the Madison Square Garden Theatre Club on St Patrick's Day. Pro boxers can return to the amateurs if they re-register with their national federations following an AIBA rule change in the lead-up to Rio 2016. Mojica earned a split-decision win - 58-56, 58-56, 56-58 - in New York. But, in a notable first for boxing in both codes, Barnes disputed the call as he thought the Dallas puncher had won unanimously. Barnes, in an ill-advised move up from flyweight to bantamweight, had his nose smashed in the first round and was dropped in the second, but that was ruled a slip. "I don't know how the judges scored it close because I thought he won every round. I'm too small for bantamweight, to be honest," said the 31-year-old Irishman. Barnes rallied late in the fight, but Mojica (12-5-1) had enough in the bank to win after six painful rounds for the Belfast fighter (5-2-0). "In the first round, he broke my nose. If I'm going to box like that, what's the point in boxing anymore? "I strongly think this is it. I always thought if I lost again, I'd retire," Barnes added. Meanwhile, unbeaten Michael Conlan improved to 11 wins after earning a 100-90 unanimous verdict across the board against Mexican feather Ruben Garcia-Hernandez in the main event at the Garden. Switch-hitting throughout the 10-rounder, Conlan, who retained his WBO International belt, was always on top en route to a third St Patrick's Day victory at the Garden. "I showed a lot of good defensive movements," Conlan said. "We were in no rush to try and take out this guy. "He went the distance with Nonito Donaire and a few other top fighters." Russia's Vladimir Nikitin, who controversially beat Conlan at the 2016 Rio Olympics, stuttered to a majority decision over American feather Juan Tapia. Conlan and Nikitin are both signed with Top Rank USA and could meet in a rematch in the professional game. Unbeaten Lee Reeves maintained Limerick's unbeaten run at the Garden this century - his fellow Treaty City southpaw Andy Lee won four out of four at the venue. Reeves beat American welter Edward Torres on a unanimous decision to improve to three wins.